Based in New York City, Kat Long has reported on environmental issues, heritage travel and historical conservation since 2009. She graduated from Sarah Lawrence College with a BA in writing and history. Her favorite local landmark is the TWA Flight Center at JFK Airport. If you have dry heel calluses, you don't have to schedule a doctor's appointment to remove them. Fortunately, rough skin on your feet rarely requires medical attention and can be remedied with an at-home routine of exfoliation, moisturizing and protection. A nightly regimen with common, inexpensive ingredients will reveal your healthier heels. Wash your feet with warm water and liquid Castile soap, a pure, vegetable oil-based cleanser. Rinse with clear water and pat dry with a cotton towel. 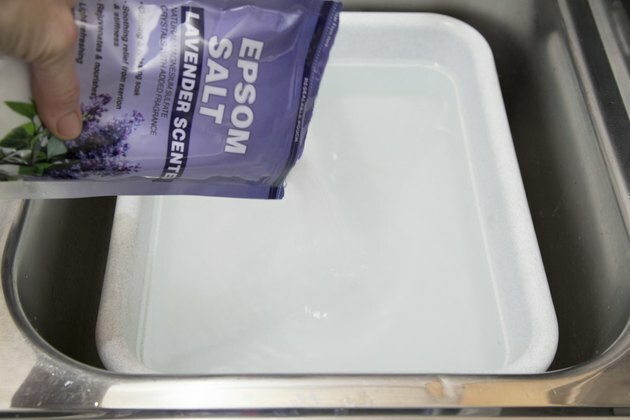 Fill a plastic tub with warm water and add Epsom salts in the dosage recommended on the carton. Soak your feet for 10 to 15 minutes, or until the rough skin on your heels has softened. Rinse and dry your feet. Scrub one heel gently with a fine-grained pumice stone. Don't rub too hard; just try to buff away the outer layer of softened skin. If you experience redness or pain, you're exfoliating too aggressively. Repeat on the other heel until both are smoother and softer. Try this trick if the rough skin proves really tough. Crush five aspirin tablets and mix into a paste with a half-teaspoon each of water and lemon juice. Spread over both heels, then wrap your feet with plastic wrap and a warm towel. After 10 minutes, unwrap and rinse the paste off. Rub with the pumice stone; the skin should flake off more readily. Apply a thin layer of petroleum jelly onto both heels. Allow your skin to absorb the ointment, and apply another layer if the skin still appears rough or dry. If your skin feels slick after a few minutes, you've applied too much. Draw on a pair of clean cotton-polyester blend socks. The cotton-poly material wicks away sweat from your feet, but helps retain your skin's moisture around dry spots, especially your heels. Rough heels are usually caused by ill-fitting shoes that rub against the heel or sole. Always wear proper-fitting shoes and socks to cushion your feet. If you have diabetes or poor circulation in your legs and feet, consult your doctor before beginning any foot-care regimen.